Nubiyan Twist are a Leeds-born, London-based musical collective. Orchestrated by guitarist/producer Tom Excell they create an unique, infectious sound in an eclectic mix of styles, drawing on jazz, hip-hop, afrobeat, latin, soul, reggae and dance music. 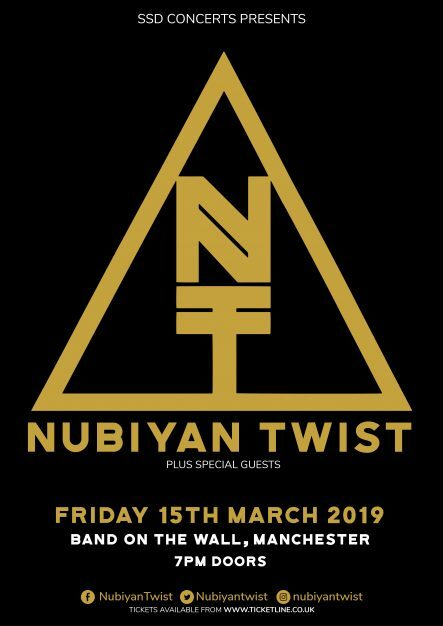 With a 10-piece live show featuring a 4-piece horn section, vocalists, electronics and an international (Brazil/UK) rhythm section, Nubiyan Twist create a powerful and unforgettable experience. Their debut album received strong support across the jazz, world music and hip-hop press, with support from sources as diverse as Huey Morgan, David Rodigan, Craig Charles, the Independent, Songlines, Afropunk and SBTV. This was followed up with ‘Siren Song’ in May 2016. The band have performed on huge stages across the world, having been chosen by David Byrne to perform at the Queen Elizabeth Hall for the South Bank’s Meltdown festival, selling out London’s Jazz Cafe, and rocking festival stages from Fusion to Wilderness, Boomtown to Edinburgh Jazz Festival, with their powerful sound and unique blend of styles. “Nubiyan Twist don’t like to place boundaries on their music – so they don’t. This is a standing show. Presented by SSD Concerts.